Rain Forest Rescue is making a difference in Mexico’s Calakmul Biosphere Reserve. The reserve’s 1.8 million acres represent the heart of the Maya Forest. The dense canopy of this marvelous forest is interrupted only by the tops of ancient Mayan ruins. It is alive with the animals that need its protective cover and abundant sources of food. It is a treasure of worldwide importance! Arbor Day Foundation’s partner, The Nature Conservancy, is working with another partner—Tropical Rural Latinoamericana (TRL)—as well as other local groups, to support sustainable forestry projects near the preserve. 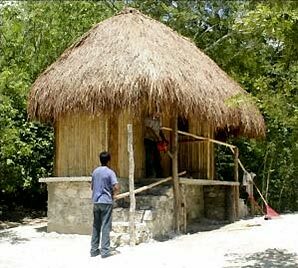 The goal is to create jobs and help local Mayan communities maintain traditional ways of life on communally-owned properties called ejidos. Significant progress is being made through offering technical advice, increasing the business capacity of the community, and providing seed money for productive, forest-friendly projects. At the same time, funds have been provided to help with direct management and protection of Calakmul Reserve. An annual work plan was developed for the Reserve focusing on fire protection and monitoring bird and mammal populations such as white-lipped peccaries, jaguars, ocelots and tapirs. Monitoring is being done with 40 “camera traps” at 15 sites. Also, Reserve staff posted new signs along access points to the Reserve and are patrolling on 4WD vehicles. 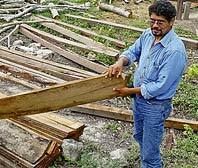 Ejido leaders in the Village of 20 de Noviembre are being helped to create sustainable forestry plans that outline selective timber harvesting cycles based on tree species and locations. This provides steady income without having a major impact on the ecosystem. 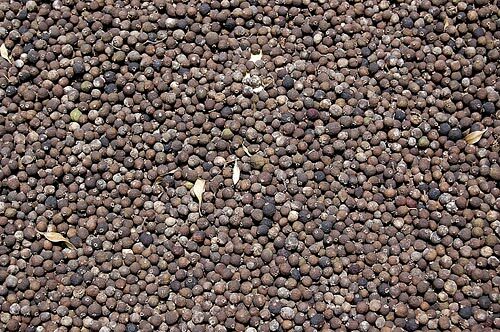 In fact, small openings created by the harvest improve the natural regeneration of light-loving, native species. This is quite the opposite of “cut and move on” logging. 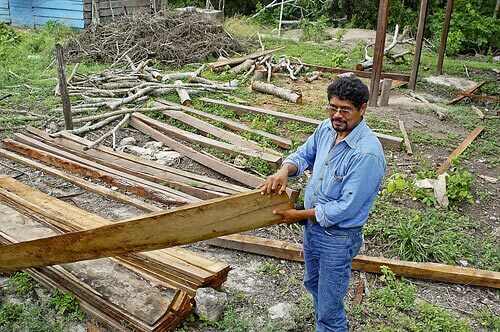 An engineer was brought in to design an improved road and bridge system that offers year-round access for the ejido’s timber harvesting operations. With access to the forest during the wet as well as the dry season, the community can now market a greater variety of timber species and sell wood—especially soft woods that must be transported soon after harvest to avoid spoilage—when demand is high and supplies are low. This allows for better forest management and higher income. 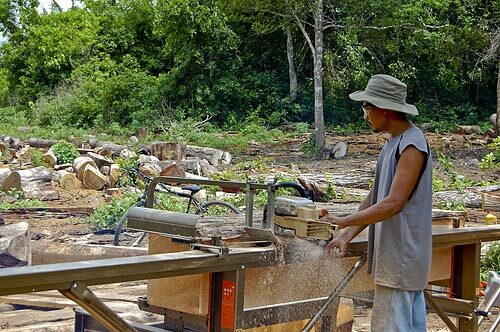 Technical help has been provided to help villagers transition from merely selling their wood as logs (at low prices) to harvesting and milling the wood themselves and selling for a higher price. Community members have been trained to use an array of lightweight, portable mills that allow them to process logs where the trees are cut. Small vehicles for transporting logs are also being introduced to remove the selectively harvested trees without the need to build additional roads in the forest. These low-impact harvesting techniques make forestry compatible with providing good wildlife habitat. To protect the forest during the dry season, a civilian protection group has been formed and trained. Among other things the “brigade” participates in flyovers of the forest to detect fires. The Calakmul Fire Committee has also inaugurated a new Fire Command and Control Center in the town of Xpujil with equipment that will take advantage of satellite surveillance and enhance coordination of fire fighting efforts. In addition, a radio network was established that quadrupled the previous radio coverage. Ecotourism is being promoted as a way to bring outside money to local residents while preventing impacts on the rain forest environment. 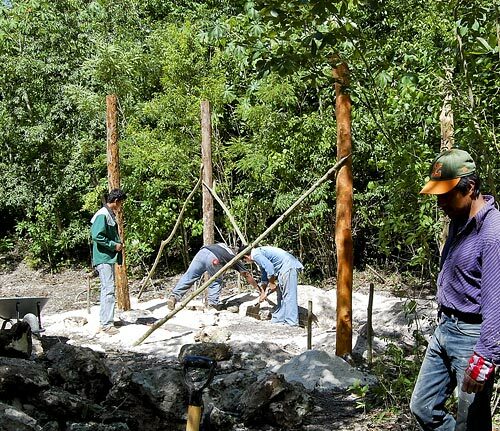 In the Conhuas community abutting Calakmul’s designed core zone, two hiking trails, latrines, camping facilitites and a new visitor’s center have been built. These facilities and guide services are now available to visitors, generating jobs and providing education. Nature-based tourism development adheres to a plan that was created to provide guidelines and monitor impacts. Like ecotourism, marketing non-timber products from the forest provides opportunities for local residents with minimal impact on the rainforest. Honey, allspice berries for the gourmet and organic market and chicle for chewing gum manufacturing are good examples. 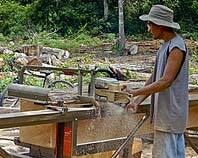 Small, portable mills make it possible for local people to process logs themselves and sell lumber for a higher income. Community leaders have been taught the principles of sustainable forestry. This, in turn, provides jobs and protects forest habitat through selective cutting and natural regeneration. 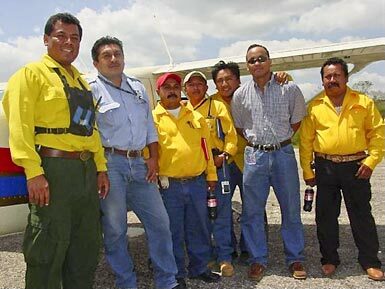 Local members of the Civilian Protection Group and representatives from Mexico’s Forestry Commission and Environmental Protection Agency in front of a plane used for aerial fire detection. 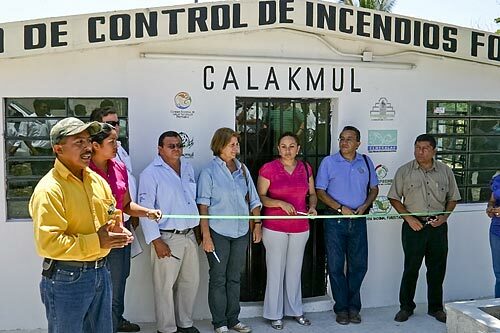 The Calakmul Fire Committee inaugurates the community’s new Fire Command and Control Center near the Calakmul Biosphere Reserve. 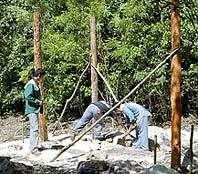 Community members beginning construction of a latrine near a forest trailhead. The finished trailhead latrine. Providing appropriate facilities is an important part of encouraging ecotourism. Berries of the allspice tree are an example of non-timber products that can be gathered and sold by local residents. Allspice is the only spice grown exclusively in the Western Hemisphere.